The Pūkiawe plant grows at higher altitudes and is abundant in the Hawai'i Volcanoes National Park and Volcano area. The plant is fairly small, only a foot or two high. It has thin branches with many narrow and tiny leaves; the flowers are small and white. 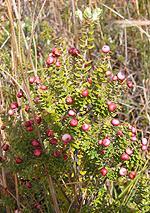 Its berries are very tiny, about 1/4 inch around and may be red, white or reddish-white in color. The Pūkiawe prefers dry and/or alpine habitat and is one of the last plants found at high altitude. While the berries of the Pūkiawe plant are not edible, they are used in the making of leis and a dye is also produced from the boiled and mashed berries for coloring tapa cloth. In ancient times the leaves were used for headaches and colds. This page is named 'Plants.pukiawe'. Can't Find It?